Simply follow the step-by-step instructions below to get all those images downloaded in no time at all! 1. First of all you'll need to download and install the most recent version of Extreme Picture Finder. 2. Click the button below to download the imagefap.com gallery template. You should allow your browser to open the downloaded file with Extreme Picture Finder or double-click the downloaded file yourself. It will open Extreme Picture Finder and add a new template to the local templates library of the program. You must see this window after you install the imagefap.com gallery template - it will be added to the local templates library. This is a one-time operation, you'll never have to do it again. From now on - only image downloading. 3. 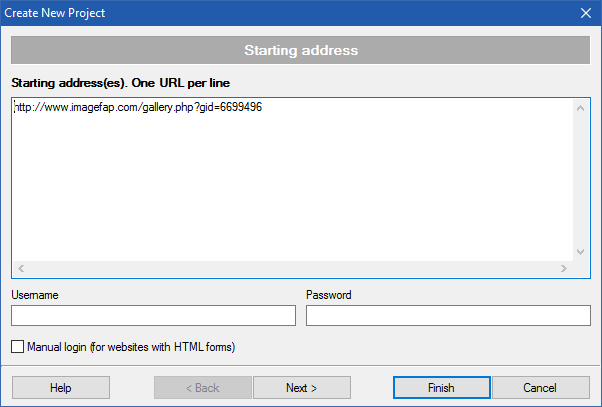 Open the imagefap gallery in browser and copy its address into Windows Clipboard. 4. Use menu item Project - New project... or click the button on the program toolbar to open the New Project Wizard window and paste the gallery URL into the Starting address(es) field. Please note that you can paste as many imagefap.com gallery URLs here as you wish. Just make them one per line. 5. Basically - that's it. You can click the Finish button now and Extreme Picture Finder will start downloading images immediately. But you can also click the Next > button several times to select a folder where all downloaded images will be saved and give your project unique meaningful title. Repeat steps 3 - 5 for other imagefap galleries. You can download all galleries from entire imagefap.com category automatically with Extreme Picture Finder! Click the button below to download and install the imagefap.com category template and you're ready to download thousands of images with a single mouse click! The process is similar to downloading a single imagefap gallery described above. You just have to use the category URL instead of gallery URL and that's it. Every gallery will be saved into its own sub-folder, so you just have to make sure you have enough free disk space. Some categories contain hundreds of thousands of galleries. With Extreme Picture Finder you can also download all galleries from a selected imagefap user. Take a look at all available imagefap.com templates. If you cannot set up the imagefap downloader for the part of the site that you want - write us at support@exisoftware.com with the URLs, we'll be glad to help! Also, please check out the Extreme Picture Finder forum where we answered hundreds of questions already. And, of course, you're welcome to download and use any other templates and projects from the online templates database.